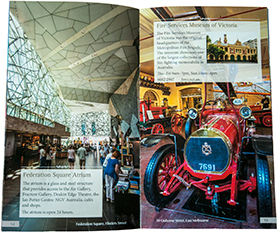 Melbourne Highlights shows the attractions and places to visit around one of the world's most liveable cities, the city of Melbourne. Popular places featured include the Arts Centre, MCG, Old Melbourne Gaol, Parliament of Victoria, Sealife Aquarium and The Tan Track. Some examples of the relatively unknown places listed include the Grainger Museum, Limelight Studios, Marshalite traffic signal. Events such as the Chinese New Year, Formula One Grand Prix, Moomba Festival are also highlighted. This is the sixth book in the series 'Portraits of Victoria'. In addition to the Melbourne CBD, the inner suburbs of Carlton, Docklands, Fitzroy, Port Melbourne, Prahran, South Melbourne & St Kilda are covered. 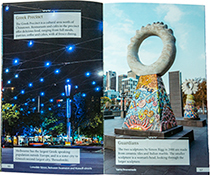 Also listed are iconic bars, cafes, chocolate shops, coffee shops and restaurants, Australian souvenier shops and a fold out map.